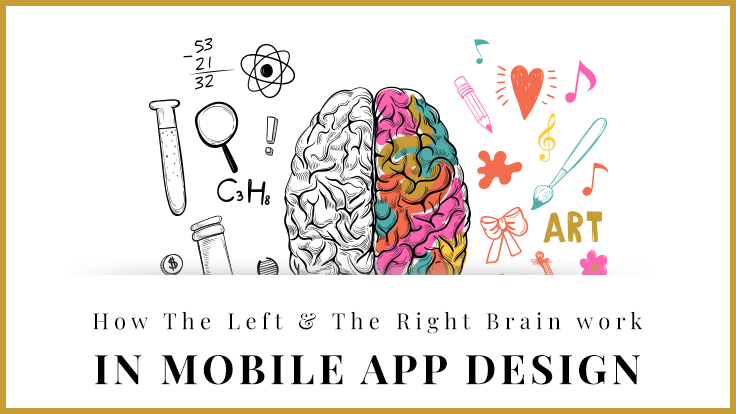 [Infographic] How the Left and the Right Brain Work in Mobile App Design? Brain-science and psychology play a vital role in a user’ experience (UX) with the mobile application. There are several characteristics that the brain-science has put together with every single hemisphere of the human brain. It is no more a secret that human brains are skilled in two distinct types of thinking. While the “left brain” is believed to be objective, focusing on logic and analytics; the “right brain” is increasingly subjective, often triggered with look and feel of your design. By having a better understanding of how the mobile app designs are perceived, the designers can make modifications; to make the apps more effective. Some designs demand you to think out of the box. They ask for exceptionally creative, original design that shoots it to fame and fortune. Others are humbly looking for a simpler way to exhibit some information. Creativity can be chaos, analytical problem solving can be monotonous. One cannot create a great user experience focusing only on one brain. It is when they come together that a truly exceptional design and user experience is created. Here is why. The left brain inspects the objective and basic aspects of your design. This way people will find adequate and thorough information on your mobile app, and that in a clear and structured way. However, they would visit your app, find what they are looking for, and leave. That’s it. No detours and frustrations. But at the same time, no engagement either. In order to connect with your users and to cater for a positive and engaging experience, one needs to use their right brain. This will help you make your designs personal, engaging, fun, special and exceptional. In a word: make your design emotional. Let us take a look at how UX designers use their left and the right brain to think in designing a mobile app. At AIMDek, we toil hard to craft exquisite functional B2B applications with clean, intuitive, expandable and friendly UI/UX designs. We just don’t build mobile apps but create top-notch mobile experiences with our end-to-end mobile application development services for consumer-facing and commercial environments.